I’m quoting that line from the song Fall on Me by Moonstar88 to describe how I felt – anxiety to the point of depression even. But I’ve discovered that music actually helps. Anyway, that’s nothing new. Music had long been used for its therapeutic effect on various conditions. You just have to know what specific music does help. This is where I learned about brainwave entrainment. So what’s brainwave entrainment? I’ll start by introducing binaural beats, isochronic tones, and delta brainwaves. Binaural beats were discovered in 1839 by physicist Heinrich Wilhelm Dove. He discovered that by sending two signals with different frequencies on both ears, the brain is able to detect and resolve the difference and creates its own signal called a binaural beat which is equivalent to the difference between those frequencies. An example would be the brain creating a frequency of 5 Hz after hearing a 105 Hz and 100 Hz on separate ears. When a binaural beat is introduced to the brain, it will resonate according to that beat. For example, after creating a binaural beat at 10 Hz (an Alpha frequency) and introducing it to the brain, an activity in the Alpha range is automatically induced as well. This is the same technique used to guide the brain into any type of mental state. Isochronic tones on the other hand are regular beats of a single tone that are used along with monoaural or binaural beats. 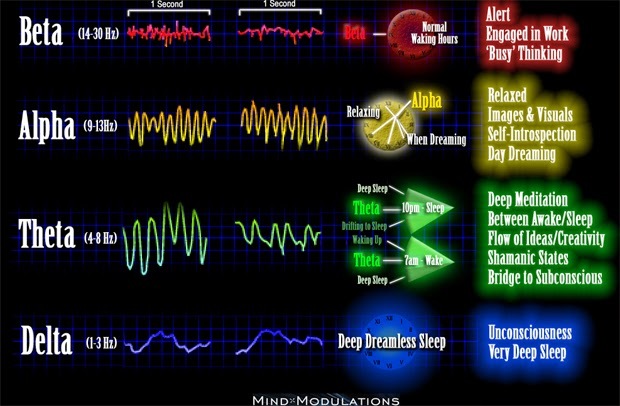 Lastly, delta brain waves are those between the frequencies of (0.5 to 4Hz) and are considered to be the most relaxing brainwave frequency range. They are associated with deep sleep stages (3 and 4) and the unconscious mind. Based on some research, introducing these frequencies for the listening ear may promote different mental states. 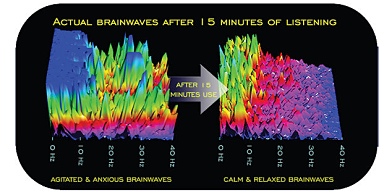 Most of frequencies in this range (0.5 to 4Hz) have similar effects which include relaxation, pain relief, reduce anxiety, induce sleep, and inner sense of calm or peace. I started by looking up binaural beats or isochronic tones for anxiety at YouTube. Most of the videos consist of just audio material but some have videos. At the first track alone, I felt the effect within 10-20 minutes. I was ecstatic to have been relieved of anxiety. This brain wave stuff does work, so I thought. So I tried searching for other tracks which help with other issues. To my surprise, every single track seemed to have worked for what they were intended for. I felt like a zombie being easily swayed by whatever the music was created for when I looked for tracks for anxiety, depression, anger, pain relief, memory, concentration, focus, creativity, alertness or waking up, and so much more. The list is endless that there were even videos that appeared to be offering beyond what’s believable like anti-aging, healing, lucid dreaming, money attraction, astral projection, sexual stimulation, attraction, and so much more. Although I can attest to the effectiveness of these types of music to stimulate the brain towards certain moods, I can’t say the same thing for other claims. This powerful brainwave entrainment can become possibly dangerous too when used for the wrong reasons. It can be used in the same way as hypnosis is done. If you’ve seen the 2013 movie called Trance, the heroine/villain was able to use her skills in hypnosis (which was initially used for positive reasons like stopping gambling addiction) towards influencing an ex-boyfriend to steal a valuable art work. But nonetheless, there’s no harm in trying brainwave entrainment, delta brain waves, isochronic tones, and binaural beats for your benefit.